Comfort, cleanliness and subtle style characterise Prague’s Cloister Inn. Offering an efficient, friendly and thoroughly customer-focused experience, it’s the perfect base for a trip to the ancient Bohemian capital. Don’t be fooled by the hotel’s unassuming frontage. Once through the gleaming glass security doors, which are locked every evening – a simple point, but one which adds immeasurably to your peace of mind – you’ll discover a light, airy reception and lounge area. The Czech instinct for hospitality is evident in the warmth of the staff, whose excellent language skills put the average British monoglot to shame. Every member of the team was helpful and keen to make our stay as comfortable as possible. Clean contemporary lines are the order of the day when it comes to the decor. Rooms are spacious and well equipped, with air conditioning and blackout curtains ensuring a good night’s sleep all year round. In the morning, breakfast is served in the fourth-floor dining room, where a wide choice of cereals, cooked dishes and breads will set you up for the day with aplomb. Prague is best explored on foot, and the Cloister Inn’s superb location makes it the perfect base for a break in this beguiling city. The winding alleyways and historical intrigue of the Old Town are just a few minutes’ walk away, but the hotel’s location on quiet Konviktska keeps traffic and other noise pollution to the barest minimum. After a hard day’s exploring it’s nice to be able to enjoy a nightcap close to base camp, and the Cloister Inn scores highly in this area too. Initial disappointment that the bar isn’t a separate area (it’s actually an extension of the lobby area adjacent to reception) is swiftly banished by the competitive prices, free wired and wireless internet access and relaxing atmosphere. There are a couple of side rooms too, if you’re looking for a little more privacy. And because it’s next to the round-the-clock reception desk, you don’t ever have to worry about closing time. 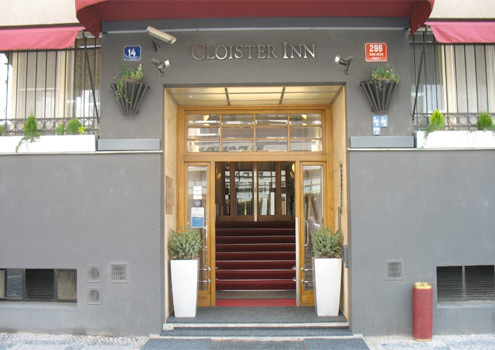 As a backdrop to a stay in Prague, the Cloister Inn ticks all the right boxes. You might only be dropping into the Czech capital for a couple of days, but this little gem combines the convenience of a city centre hotel with the tranquility of somewhere altogether more exclusive. It’s as modestly priced as its name suggests, too – allowing you to enjoy Prague’s many charms even if funds are tight.